The Samsung SmartCam security cameras come with a lot of features, some of which are only available through their web site. An alarm schedule is one of those features. This article will show you how to setup an alarm schedule for your Samsung SmartCam. It’s not hard when you know how to do it. Like most home security cameras, the included documentation is minimal so this information isn’t easy to find. An alarm schedule is a way to tell your camera when motion or sound alerts should be monitored. Everyone is probably working between 9 and 5 so you might just want motion alerts to be active during that time. In the evening, everybody is home so you might want to have the motion sensing off during that time, then maybe on again while you are sleeping. The alarm schedule is what is used to control all of this as it pertains to motion and sound events. If you have tried searching your smartphone for the alarm schedule, you didn’t miss it because it’s not supported in the app. You need to visit the Samsung SmartCam site. You may have visited this site when first setting your camera up. The password for this site is separate from the one on the camera and might not be the same. Log into the site, select your camera, click the setup tab, click the schedule tab. Now it’s time to setup the schedule. The default button is “Always” meaning you don’t have a schedule set and motion alerts that you have established are in effect 24 x 7. Click the “Only Scheduled Time” button and you will be presented with a grid that shows the seven days of the week and 24 hours. 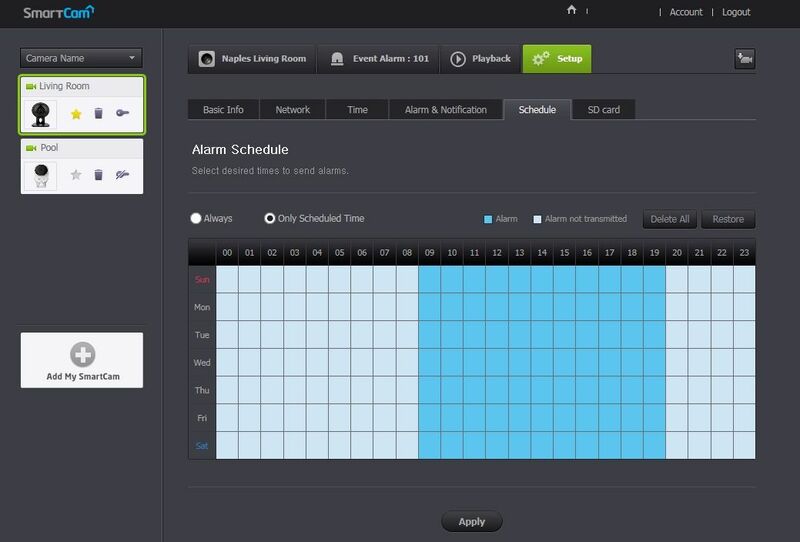 Click on the boxes that correspond to the times when you want alarms to be transmitted. The boxes will turn blue. The unchecked boxes will remain white and during those times no alarms will be generated regardless of it there is movement or not. Click “Apply” and your schedule is in effect. The photo that accompanies this article is what it should all look like after applying a schedule. If you ever decide to turn off the schedule, say for vacation purposes, simply go back in and check the “Always” button. When you return, get back into the schedule tab and re-check the “Only Scheduled Time” button. Your old schedule will remain and you don’t need to recheck all those boxes.